I'm a collector. I have been since I was a wee bay. My mom and dad used to get so annoyed and tease me about all the "garbage" I had hidden in boxes and under my bed. I was so offended. My broken pieces of sea glass, and feathers were keepsakes from trips to the beach, and hikes in the woods..I was and still am a gatherer. If I have more than one of something it becomes a collection and I will add and add to it. Sometimes I let them go after they have run their course (man wall, small things wall) and others just grow and grow (ceramic home made, but thrifted mugs) If there are 2 things I can never get enough of when thriftin,g it's ceramic mugs and floral silky bed jackets. love. 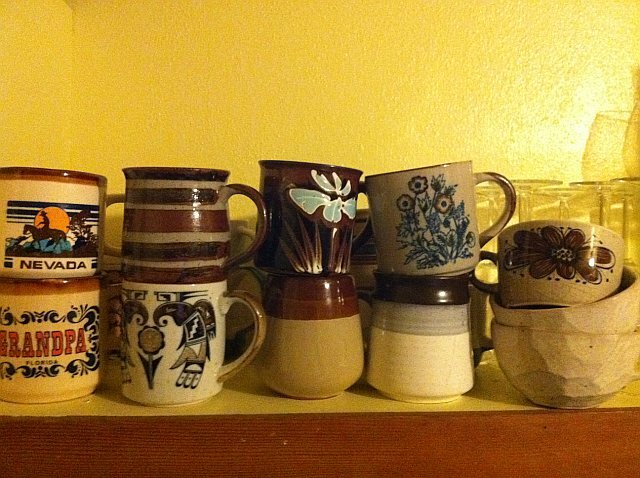 im also a collector of ceramic floral mugs. i have completely filled up my moms cabinets and almost my boyfriends ha.